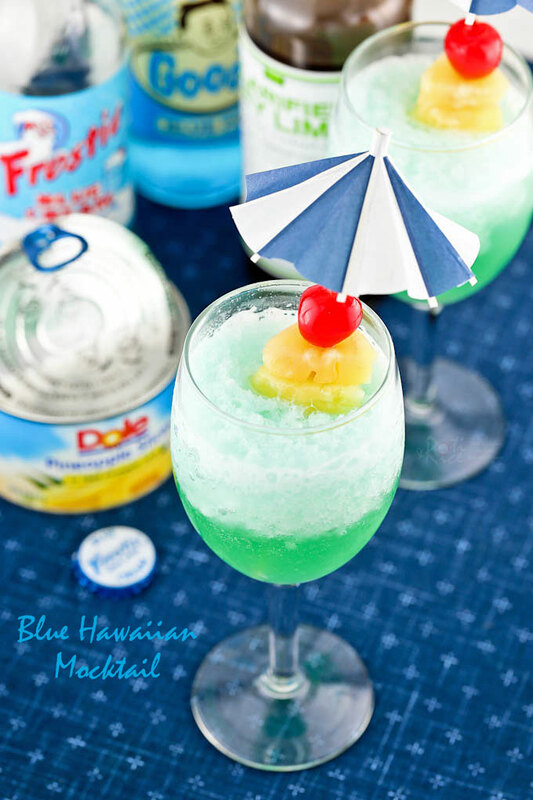 This cool Blue Hawaiian Mocktail is a fun drink to prepare for any occasion. Only 3 ingredients and some crushed ice are needed. Happy New Year! Soft drinks in glass bottles may be a thing of the past but they do still hold their charm. I recently came across an entire shelf of bottled soda at a store and the blue ones immediately caught my attention. I had to bring a couple of bottles home as I figured it may be fun to make some cool Blue Hawaiian Mocktail for the New Year celebrations. For the uninitiated, mocktials are essentially non-alchoholic cocktails. These drinks are usually dressed up like a cocktail containing a mixture of fruit juices and soft drinks. They are a fun alternative for teetotalers. 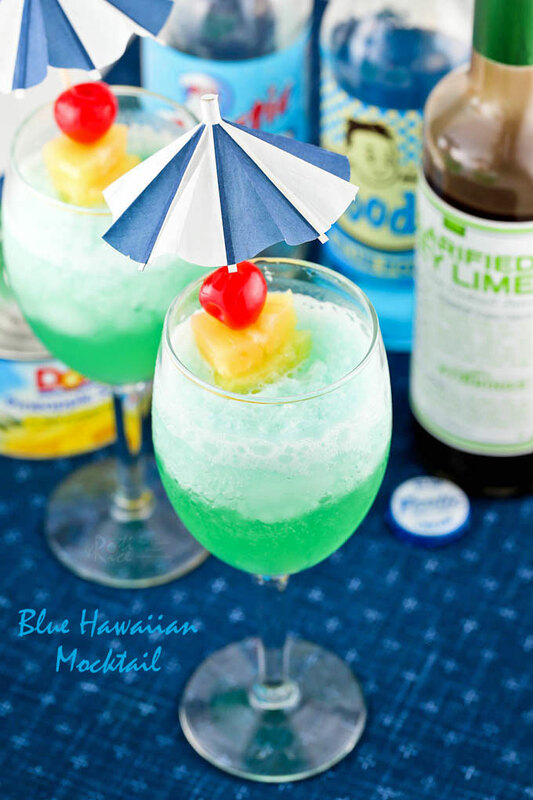 The Blue Hawaiian Cocktail is one of the most popular blue drinks out there. According to this site, the original recipe was created by Harry Yee, a bartender at the Hilton Hawaiian Village Resort and Spa in 1957. It contained light rum, vodka, blue curacao, pineapple juice, and sweet & sour mix. Today, many variations of this recipe uses creme de coconut to give it an even more pronounced tropical flavor. 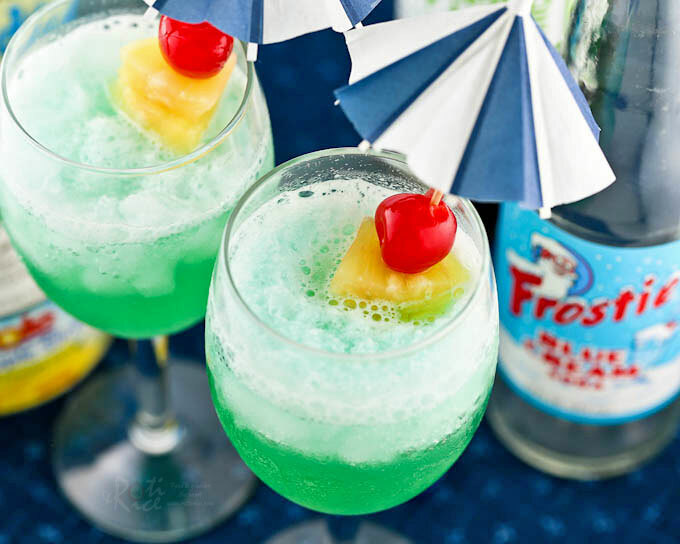 The recipe below was concocted using blue cream soda, pineapple juice, and some clarified key lime I had in my pantry. I even added a splash of rum in my first try but the concoction was more green than blue because of the yellow and brown colored additions. The second time round, I increased the amount of blue cream soda used and kept it virgin. Blend all ingredients at high speed until frothy. Pour contents into a tall glass and garnish with maraschino cherries and pineapple wedges. The yellow pineapple juice and clarified key lime still turned the blue cream soda slightly greenish. It tasted good and I am fine with the color. Please add a drop or two of blue food coloring to turn it back to a cyan blue if preferred. It is just as cool blue or green. 😉 Do give it a try. Where can I purchase Clarified Lime Juice? I have searched everywhere and can’t find it, and it just looks so complicated and time consuming to clarify it myself. This drink is really good even made with regular lime juice. It was a huge hit at my daughter’s beach-themed pool party. I would just like to make it prettier! 🙂 Thank you! I purchased my bottle of Clarifies Lime at Homegoods. This is actually my second bottle. You may have to search for it online. Unfortunately it is out of stock on Amazon but you can take a look to see what it looks like HERE.